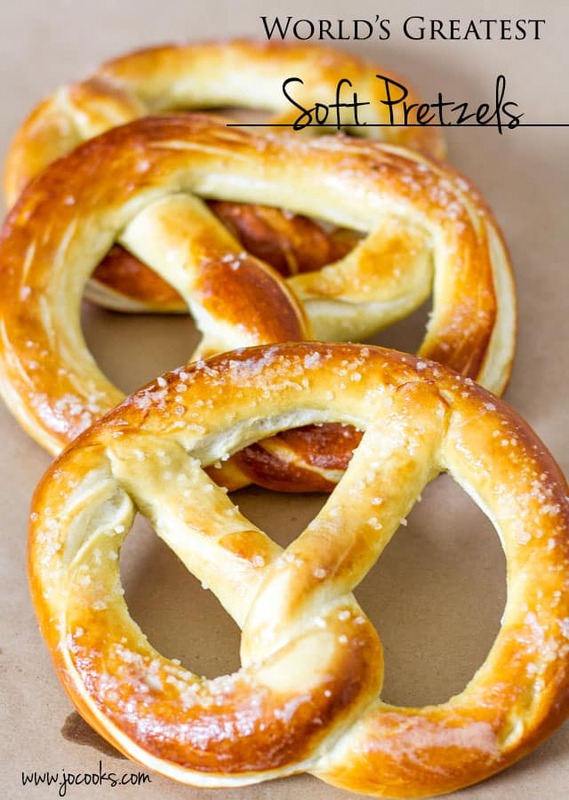 World’s Greatest Soft Pretzels – huge pretzels that are soft, buttery and salty, you know the ones I’m talking about. My husband and I love our pretzels and we make them quite often. But for some reason we’re not quite pleased with them, we’re looking for that special soft pretzel that you get at the mall, or at the ball game. You know the one I’m talking about, eh? Those huge pretzels that you just can’t stop eating, they’re salty, they’re buttery, they’re just amazing. Well I think we finally hit the jackpot. After the hundreds of experiments and hundreds of pretzels eaten, we’ve finally done it. We made the pretzel of our dreams. The world’s greatest soft pretzels. Don’t let the pictures fool you, these pretzels are huge, just like the ones you buy at the ball game. Just writing about them now makes me drool and wished I had one to enjoy, but hey we made these a couple weeks ago, so no pretzel for me now. But I have the memories, and most importantly I have the recipe. 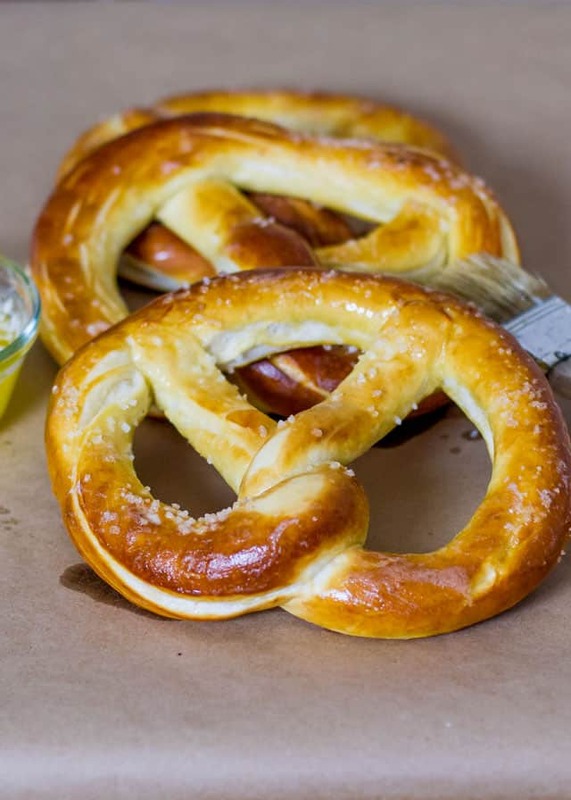 Pretzels are not hard to make, so don’t get discouraged by the fact that you have to make a water bath with baking soda and dip them in there, that’s child’s play. The dough is super easy to make too, just use your mixer, let it do all the work. And the fun part, is rolling out the long ropes and I swear my ropes were 3 or 4 feet long, just because I wanted the largest pretzels. 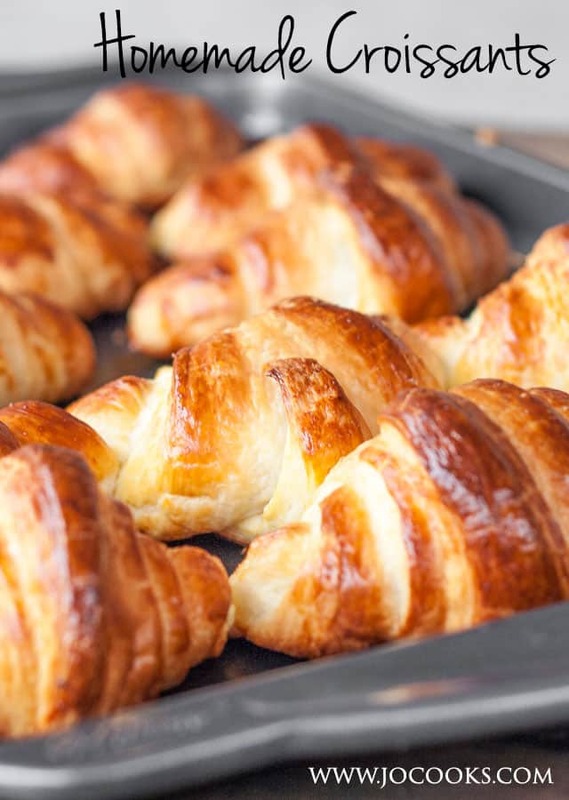 Now let me just tell you for a minute here how good these are, especially if you eat them right out of the oven. 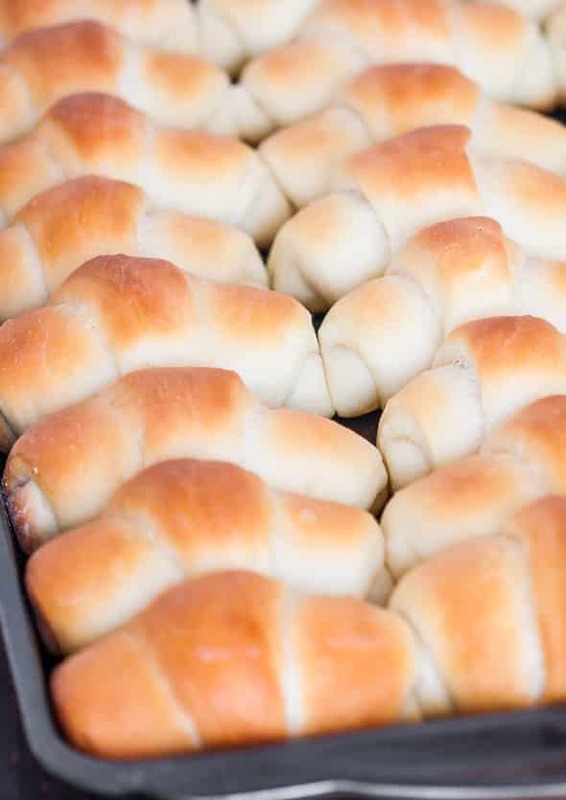 When they come out, brush them with some melted butter, and before you take a bite, dip that piece in the butter again and then eat it. The saltiness from the coarse Kosher salt and the buttery pretzel, well this just doesn’t get any better. You’ll just want to keep on eating, so don’t let me stop you. World's Greatest Soft Pretzels - huge pretzels that are soft, buttery and salty, you know the ones I'm talking about. In the bowl of your mixer, combine the warm water with the yeast and lightly stir. In another large bowl, mix the salt, sugar and flour together. When the yeast dissolves, add the flour mixture and the warm milk. Using the dough attachment, mix everything until the dough comes together and is no longer sticky. Let the dough rise until it doubles in size in a greased bowl, and covered with a damp towel. It should take about an hour. Punch down the dough and divide it into 9 pieces. Take each piece and roll it into a long rope, about 3 to 4 feet and about 3/4 of an inch in diameter. Shape each rope into a pretzel shape and place them onto greased cookie sheets and let them rise again for about 15 minutes. In a large pot, make a bath with baking soda and boiling water. Using a large spoon, lower each pretzel into the water and leave in for about 30 seconds to a minute. You don't have to wait until they float. Return the pretzels to the cookie sheet and brush them with melted butter and sprinkle them generously with the Kosher sea salt. Bake until golden brown, about 10 minutes, depending on the oven. When you take them out of the oven you can brush them again with butter and serve them hot and/or with mustard. Prep time includes time to allow the dough to rise. Cook time is per one cookie sheet at a time. I was able to place 2 pretzels per cookie sheet, so I baked 4 times. Nutritional information is for 1 pretzel. Please keep in mind that nutritional information is a rough estimate and can vary greatly based on products used. This is my 3rd recipe I’ve tried and this is the recipe I will use over and over.They are Delicious! Thank you for sharing your recipe, can’t say enough about it! Do you recommend spraying the cookie sheets with Pam before putting them back on after the baking soda dip? Mine were so stuck to the on I lost the crunchy yummies from the bottom of the pretzel. Yes you can do that for sure! You can also try out some parchment paper. These are so good! I’m German and I thought these were the perfect mix of Bavarian pretzels and American mall pretzels. They were even good reheated in the oven for a few minutes!! Can you use the same amount of gluten free flour to all purpose flour? Yes you can, but you may need to add some xanthan gum to replace the gluten so they don’t turn out tough and crumbly. I made these today! Turned out awesome. Have some Romanian friends from college they are the best! Made the pretzels. Loved it. So easy to do. I have never made a bread with yeast in my life or boiled any before. They came out just like the pretzels you buy at malls and fairs. Thank you for the perfect soft pretzel recipe! My pleasure, glad you liked the recipe! On the pretzels can I make them smaller and put them in the freezer to reheat them for snacks? Yes, for sure! These would freeze nicely, I’d wrap them tightly in plastic wrap though. I have tried this recipe and all seemed to go well. I just made 18 pieces instead of 9, I did not want them to be very large. After the 15 minutes rest at the end, they looked very beautiful. But when I picked them up to drop them in the boiling water they collapsed and never rised again. So I got some sad, flat looking pretzels. 🙁 I wonder what have I done wrong? Hi Raffaela! I’m not sure, did you add baking soda in the boiling water? Sometimes it’s better to handle them with a slotted spoon so lift them onto a slotted spoon and place them in the water with the slotted spoon, so you don’t handle them so much. If you use the lukewarm water for the dough…. how much water is used with the baking soda for the bath portion ??? Enough to almost fill your pot, so it depends on how big your pot is. 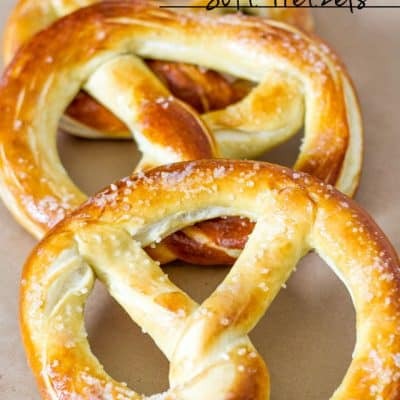 I just made these pretzels – they are sooooo good! They were crustier than most bakery pretzels and oh so buttery. I paired it with a glazed made from powdered sugar, hot water, and leftover melted butter. A perfect mix of salty and sweet for a decadent dessert pretzel. We love soft pretzels! 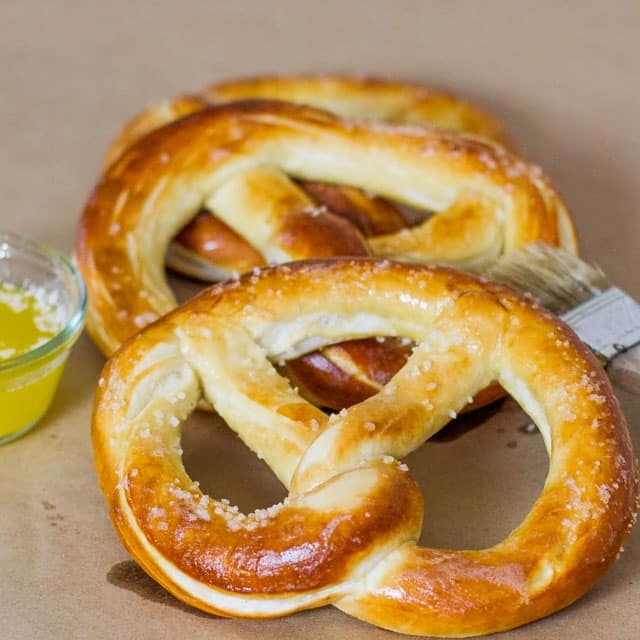 The other recipe I use says to let the baking soda bath before adding the pretzels, in this case, are you adding the pretzel to the boiling water? That’s how my bagels are, just clarifying! Thanks. Can you make the dough in advance? You can, I would just wrap it in plastic wrap and refrigerate it. I’ve made these several times now and they are amazing!! My husband and kids think I’m the greatest pretzel maker on earth now! Thanks for the recipe!! 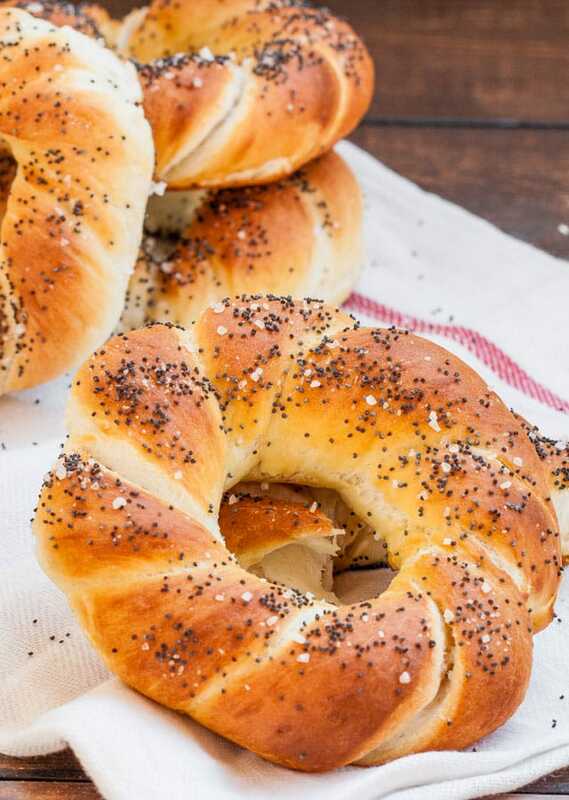 I wonder if you can use this recipe as is to make pretzel buns. My pleasure, so happy you like it! How much water do you boil them in? Doesn’t matter, depends how big your pot is, just fill it with water. He had kind of yeast does this take? Is it the active dry or instant? Can I freeze the extras? If so, how do you heat them? Absolutely! You can reheat them two ways, microwave them for about a minute or so, or put them on a baking sheet and pop them in the oven at 350 for a few minutes. I sure it is my fault, but I don’t know what I made wrong. The dough was a little sticky, but not all flours are created equal I assume. But after baking them the pretzel haf such a strong taste of baking soda that we couldn’t eat them. I added 5 tablespoons not more into one litre of water. Do you have any ideas? Thank you in advance. That’s strange, the only thing I can think of you kept them too long in the water? They should only stay in there for about 30 seconds. Aniko wrote that she used 5 tbsp of baking soda for 1Liter.Way to much. A large pot holds at least 3-5L of water. You’re recipe states 5 tbsp for a large pot of water. Yes that’s the problem exactly. That’s way too much baking soda for only 1 litre.